The national rankings were just released for the first time this season! The TarWheels are proud to announce their 3rd place rank among the 76 total teams registered in the NWBA - Division III this season! There are 190 teams this season in the NWBA, this includes Championship, Division III, Women's, Intercollegiate Men's and Women's, Junior 10', and Junior Prep Divisions! The rankings can help when entering tournaments, the goal of course is to be seeded as high as possible when the national tournament comes up in April! The UNC Charlotte 49ers will be hosting Florida Atlantic at 7pm Wednesday, January 30th. The TarWheels will take to the floor at halftime to give a little demonstration of wheelchair basketball. 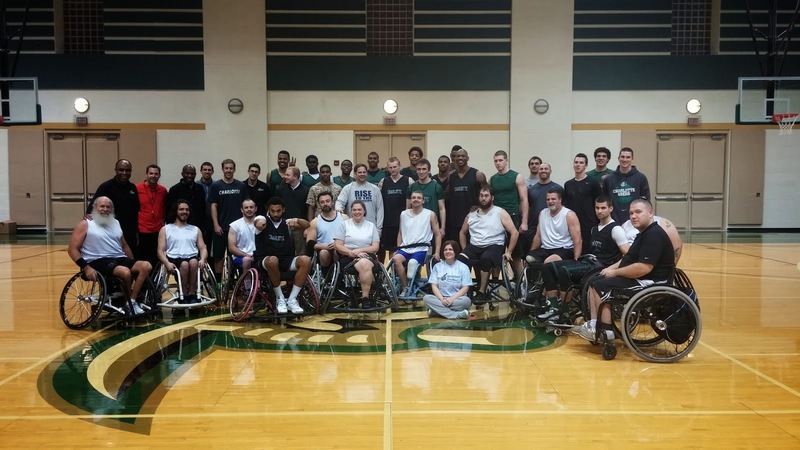 In December, the 49ers and the TarWheels took to the court together for a fun night of practice. The 49ers' players tried out a new perspective on the court and rolled around for a scrimmage against each other and against the TarWheels! Everyone enjoyed themselves, and as you can imagine, lots of laughs were had! For those who might be checking out our website after watching the game, please make sure and add our Facebook pages (column at right) so that you can be notified of and catch one of our home games! A look back at our practice with the 49ers in December.